MIACA presents "Once, there was the sea"
helped the reclamation. In the 1980's, a new kind of reclamation project was started as developers built shopping malls, an observatory tower, hotels and cinema complexes. The area has been developed so completely that it is hard to imagine that there was ever sea here. The project "Once, there was the sea" invites the audience to reminisce about the beautiful sea that once existed at the venue. The Creative Space 9001 is located in the middle of Sakuragicho Station, where　traffic, both human and car, never stops. The Japanese people used to believe that everything has its own unique spirit and its own memory. today this is seen as an archaic romantic story. "Once, there was the sea" will remind people of these myths, creating a hideaway from busy everyday life. In Mai Yamashita and Naoto Kobayashi's one thousand waves, the artists count the waves at the shore until they have counted to one thousand. The meaningless and obsessive act creates a vivid contrast between the enormity of nature and the insignificance of human actions. The voice of the artist counting waves sounds like a prayer, reminding us of the immortal existence of mother nature. 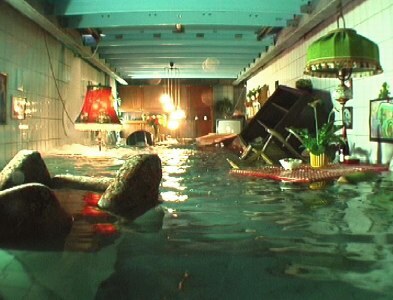 In "Flooded Home ", Susanne Kutter gruadually floods an ordinary house. Finally the whole room is filled with water. I! t is funny and endurably attractive as we see ordinary items such as a sofa and a potted cactus floating in blue water. According to the　psychologist Carl Gustav Jung, water is a potent symbol of our unconcscious minds; this work seems to be a metaphor for our deepest mental processes.